Growing up in a car family, I’ve always had an interest in vehicles and vehicle modification. I’ve always driven sports cars and coupes and made the switch to a larger 4 Wheel Drive SUV when I moved back east to handle the snowy conditions. When I moved back to California, I downsized to a small sedan since I was commuting far from work. I quickly realized that with all my hobbies and interests, along with my addiction to gear and gadgets, that I’d need to consider a new option to better suit my needs. On weekends, my car would be filled to the brim, even the front seat – with mountain biking, beach, hiking and hockey gear. It was driving me nuts. Not to mention, I wasn’t able to fit my Bernese Mountain Dogs in my car for adventures. It was time to go car shopping. After a couple months of researching online, I landed on the perfect vehicle for my needs. It would be able to handle camping trips, fit my dogs, and comfortably fit my friends and my gear. Not to mention, it looked awesome. My vehicle of choice was a new 2017 Toyota 4Runner TRD PRO in the Cement Grey colorway. 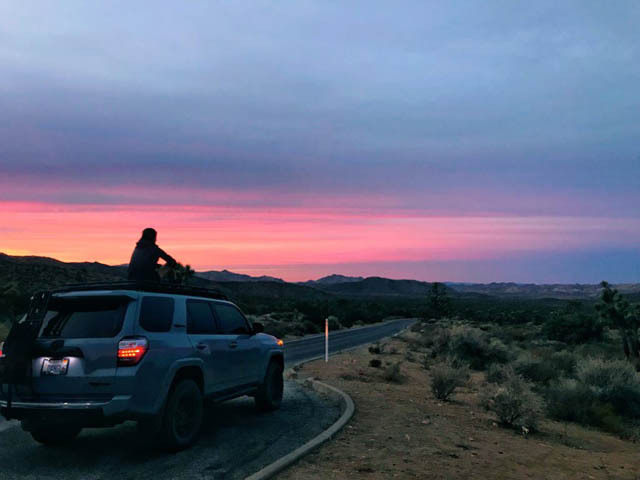 For as long as I can remember, my family has always driven a Toyota – from Camrys to Tundras, to classic FJ Land Cruisers, so it was an easy decision to make – not to mention it made my parents happy. I quickly discovered that finding the specific model and color that I wanted was no easy task. The TRD PRO is a limited trim model from Toyota, with just over 3,000 of them produced in the current 5th Generation 4Runner. 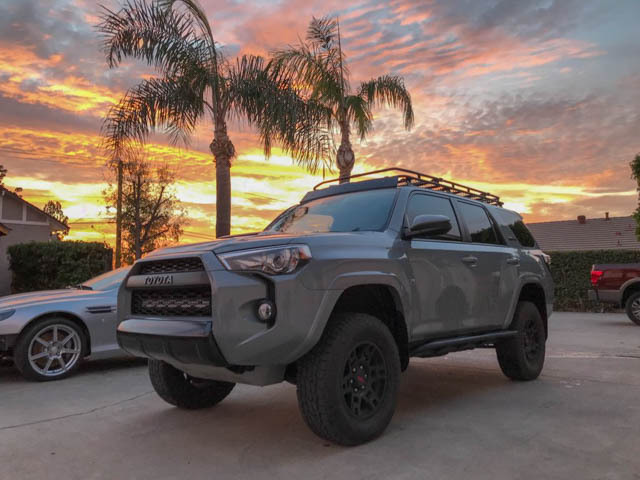 The Cement Grey color was only made available in one year of the 4Runner and only available in the TRD PRO trim making it even more different to find, adding another obstacle to the mix. In Southern California, where the demand is very high for this specific vehicle, dealers have wait lists that can be as long as 6 months, on top of a “market adjustment” fee added on top of the MSRP that can be as high as 10 to 20% over sticker price. My original car budget and timeline did not account for all these issues. But I was committed to this car, and had to have it. I was going to find a way. I believe I may have contacted close to 100 Toyota Dealerships when hunting for my new 4Runner. I was bombarded with emails and phone calls from dealers who were essentially listing TRD PRO models available for sale through Cars.com just to offer you a different model. 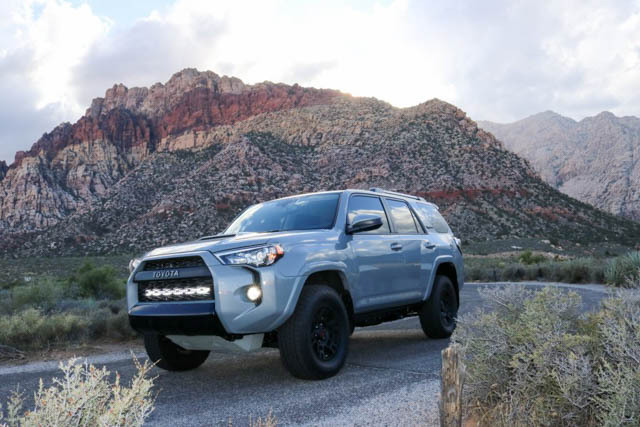 Some dealers offered spots on their wait lists, but couldn’t provide accurate time frame estimates, or guarantee that they’d get an allocation of TRD PROs at all. Others simply told me that I wouldn’t be able to find the car. It was a frustrating process to say the least. Eventually, I landed on a dealership located in the small town of Winona, Minnesota who told me they had a car arriving in 3 months and that the first deposit got it. That same day I gave them my credit card for a deposit and the countdown began. Buying a car from Minnesota meant that I’d be shipping it from the dealer to Southern California. The cost to ship an SUV was going to be around $1,000 which was going to be significantly less than paying the “market adjustment” prices anywhere on the West Coast. It also added 2 weeks to my wait time. I placed the deposit for my new car on April 11th and finally took delivery on July 11th – 14 weeks later. 14 Weeks left a lot of time for daydreaming about my new car. I had followed a few 4Runner accounts on Instagram early in my car buying process and that provided plenty of inspiration for my future build. I had my long wish list of mods ready. When the car finally arrived, I was so excited. I had only seen 2 TRD PROs in Cement Grey in person and had actually never seen the inside of a TRD PRO trim level car. Toyota is not known for flashy, high-tech componentry. As a tech-loving millennial, this was probably my biggest concern before making the switch to Toyota. After inspecting the ins and outs of the vehicles, I was relieved when it met all of my needs. It was going to be the perfect adventure vehicle for all of my hobbies and future road and camping trips. In the first week of owning my new car, I started purchasing my first accessories and mods – mainly small trinkets that would help my everyday use of the car, along with some minor cosmetic updates. Knowing that it’s very common for long lead times on car parts, I placed my deposits on my C4 Fabrication Rock Sliders and a few weeks later on my Gobi Rack Stealth Rack and Ladder. The C4 Rock Sliders were listed as an 8 week lead time from C4 Fab. I received them on my doorsteps exactly 8 weeks from the order date, with my custom TRD PRO text step plates. The Gobi rack was a different story. When I originally placed my order, I was told to expect an 8-12 week lead time for my roof rack. It took over 21 weeks for me to receive my Gobi Rack to my door. As much as I want to be frustrated with Gobi, I love my rack and I’m happy that I chose to go with them for my order. 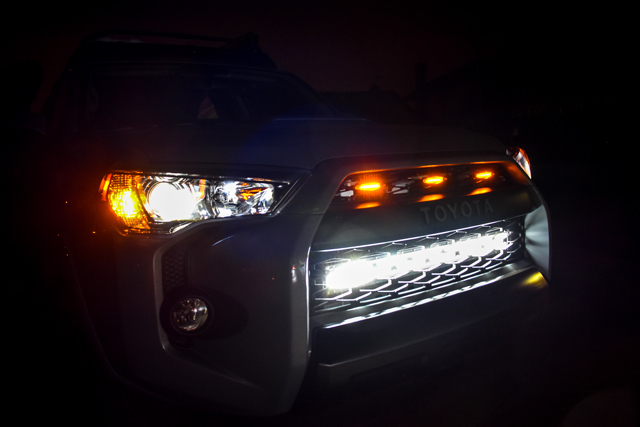 I’ve always been a big fan of the Amber LED Grill Mod for the Toyota 4Runner. I wasn’t a big fan of the way it was done with a lot of the DIY options out there. I decided to make my own insulated wiring harness with custom fit LED lights to make a factory look on this install. These Raptor-inspired lights are one of my favorite mods to date. I’ve always been a fan of Interior LED lights. I think I’ve made this upgrade on every vehicle I’ve owned. The Precision LED Interior Lights from Xenon Depot do a great job of lighting up the interior of your car. I think the clean, white, vibrant color of the LED lights look really great on dark interiors. Not to mention that LED lights have a longer life and draw less power than traditional bulbs. Buy the Precision LED Interior Lights from Xenon Depot here. The H11 LED Headlight Kit from Xenon Depot was actually the first purchase I made for my new car. I ended up upgrading my bulbs less than 300 miles in. I think the one thing that was really lacking with the OEM set up of my 4Runner is the Halogen headlights it came with. They were not very bright at all. I love the crisp white look on the front of the car. They do a great job of lighting up the roads. Buy the H11 LED Kit from Xenon Depot here. After running my LED highlights for a couple weeks, I decided I wanted to go the LED route on my fog-lights to match. I liked the XTREME LED fog lights for the 5500k color output that matched closely to my headlights. This was purely a cosmetic addition. For some reason, the rear Toyota emblem on the TRD PRO model comes from the factory in Chrome over a black background. The front emblem and side TRD PRO badges come blacked out. I really wanted all my emblems to be blacked out and matching, as the chrome was random and didn’t make sense to me. The NOX LUX Emblem Overlay Kit installed very easily, basically a plastic ‘sticker’ that sits on top of the factory chrome logo. They’ve held up well so far. 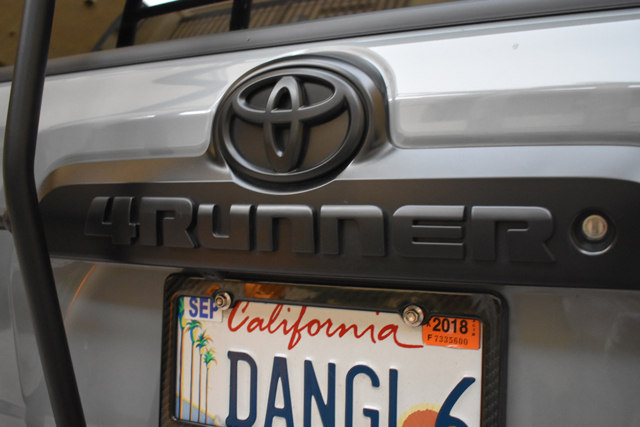 Unfortunately, you aren’t able to buy just the rear logo alone in a black overlay kit, so I purchased the entire SR5 kit and gave away the extra emblems on one of my Toyota groups to a fellow 4Runner owner. Buy the NOX LUX Blackout Emblem Overlay Kit for 5th Gen 4Runners here. The Modular Storage Panel from Rago has been one of my favorite additions to my car. I was able to snag a deal on the panel through one of Rago’s Garage Sales. The panels do not require any drilling for installation and it fits perfectly with no rattle or shake. 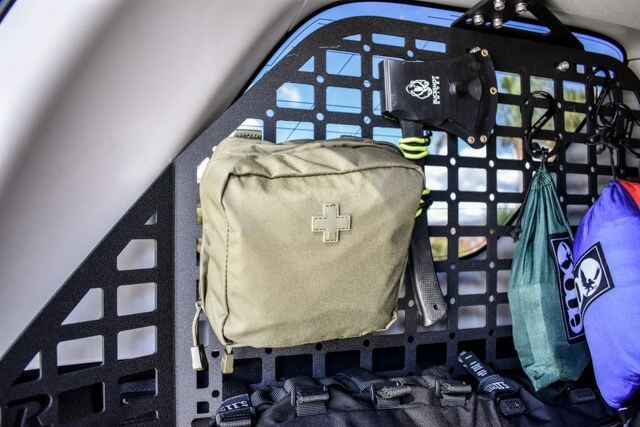 The metal Molle panels allow you to add storage packs and S hooks to keep items secure in your vehicle. I chose to install one panel, on the driver side, so it wouldn’t cause interference looking out the passenger side rear window. 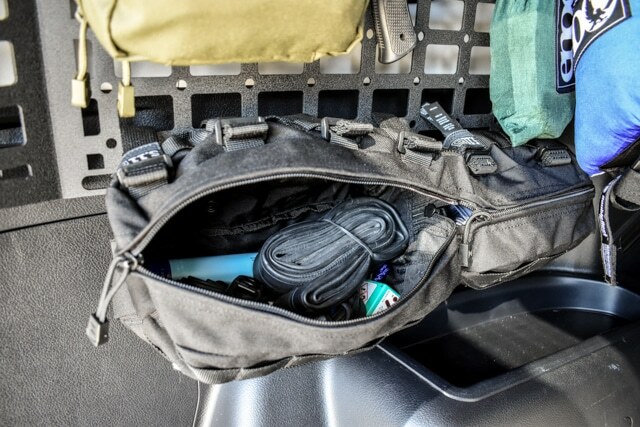 I purchased accessory bags from 5.11 Tactical to mount a variety of times in my car. It’s nice to be able to just keep my car supplied with tools and accessories at all times. It’s already come in handy a number of times. The added bonus of the bottle opener is a fun touch at campsites and tailgates. I decided a med pouch with basic human and animal medical supplies would be handy. I frequently go hiking or mountain biking, so it’s a good idea to keep these items around.. Plus, you’ll never know if someone else at the trailhead may need assistance. In my other two pouches, I keep a variety of tools, mountain bike tools, spare tubes, pumps, etc along with some flashlights, nutrition and water filtration. 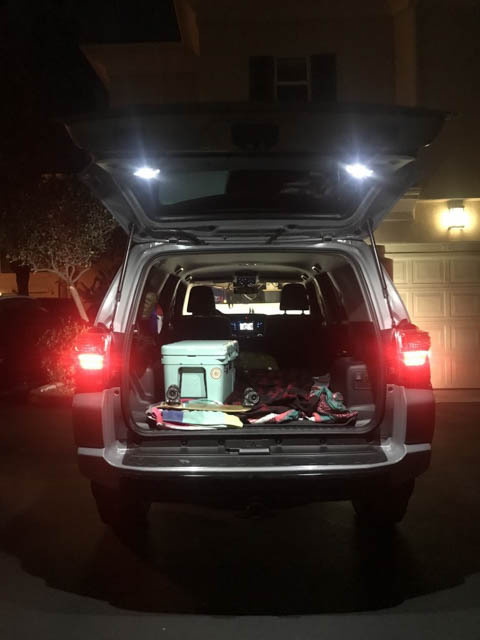 I’ve always been a fan of LED lights on off-road vehicles. This was another impulse purchase that I can admit I didn’t really need for functional purposes. I really just liked how it looked. Rago Fabrication did a great job with this mounting kit. It looks sleek under the OEM bumper and was an easy install. I purchased this through another Rago sale so it was a great deal. Rock Sliders were probably one of the toughest purchase decisions for my car. 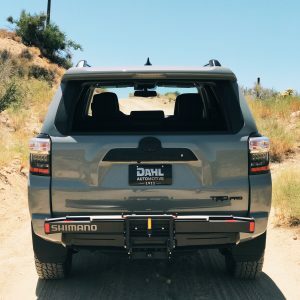 There are so many companies making great looking sliders for the 5th Gen 4Runners. I ended up going with the C4 option purely based on looks. There are some options that are less expensive and don’t weigh as much, but I really liked how I could customize the sliders the way I wanted them. C4 allows you to choose if you want step plates or not and if you’d like cut-out text added. Of course, I went with TRD PRO lettering to keep the theme alive on my car. They also ship in raw metal, so you’re able to decide how you want them painted – if at all. I went with a matte black option on the tubing and wrinkle black on the step plates. I thought this gave it a cool two-tone look. 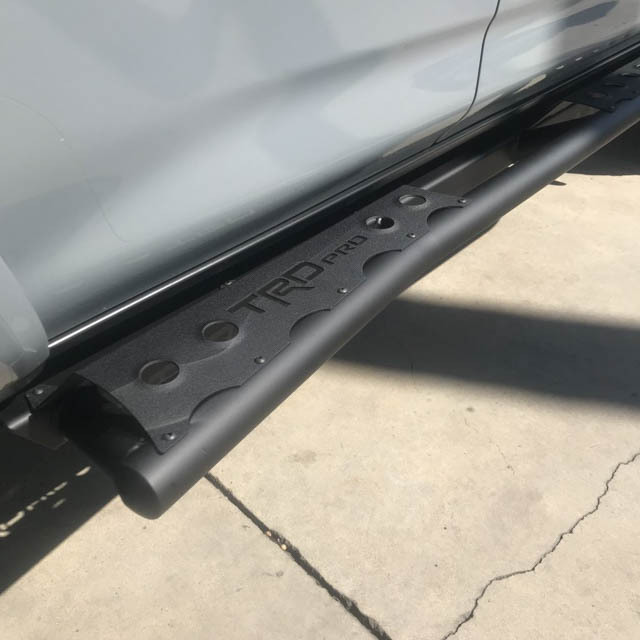 Rock Sliders are designed to protect your vehicle body while off-roading, but I also realized that these heavy duty sliders added significant strength to my car’s chassis and would help prevent door dings from lower vehicles. A win-win. I’ve always really liked the look of a full-length roof rack on 4Runners. Gobi has been a leading brand in this category, and for a reason. It’s a really well-constructed and rack solution. I went with the full-length rack from Gobi because it allowed me the flexibility to haul for long trips. I also purchased the rack with the intention to buy a rooftop tent along the way. With this rack, I’m able to haul a roof tent as well as other supplies along the way. The title itself sold me on this one. I try to be a very organized person, so I loved the idea of being able to add some organization to the OEM Center Console. Without this, the center console on the 4Runner is basically a giant black hole. That would have driven me crazy. I use this to store my sunglasses, flashlights, etc. 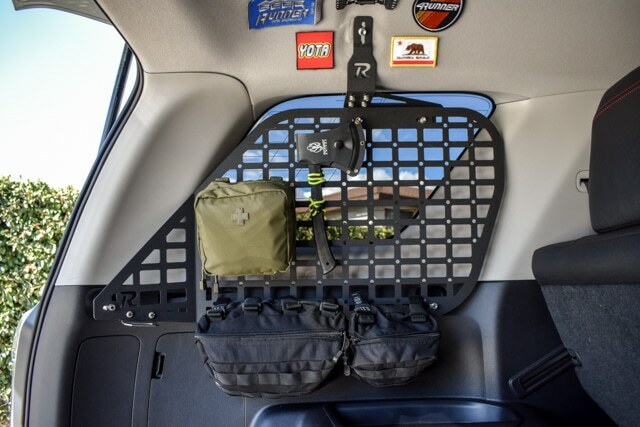 Buy the Vehicle OCD Center Console Organizer for Toyota 4Runner here. This was purely a cosmetic purchase. I wanted to keep the TRD theme alive all around the car. 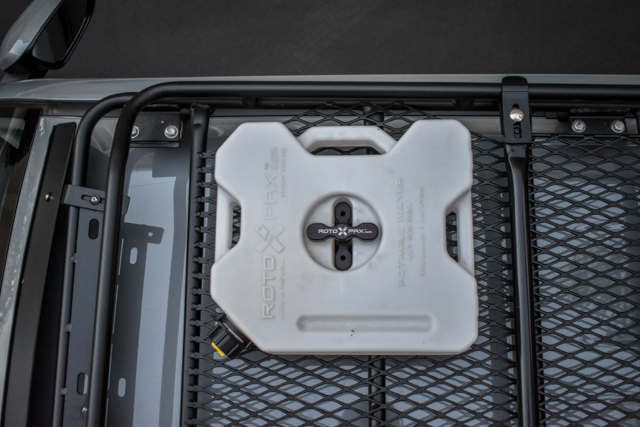 I like the Rotopax mounting system as it feels very secure and works well with the Gobi Rack. I carry the 1.75 Gallon Water Container for camping trips. I’ve also used it when taking my dogs hiking. I will most likely look into adding additional Rotopax storage containers in the future. 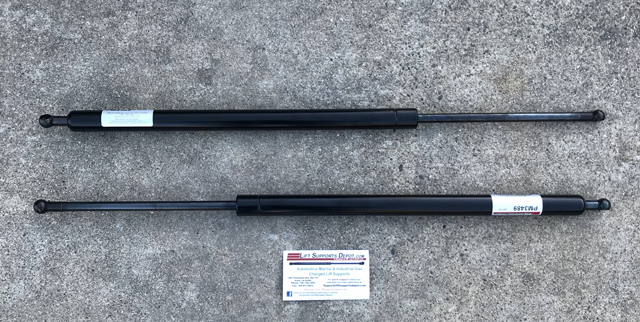 The DayStar Spacer Lift Kit adds a 1.5″ lift to the front of my car and a 2.5″ lift in the rear. 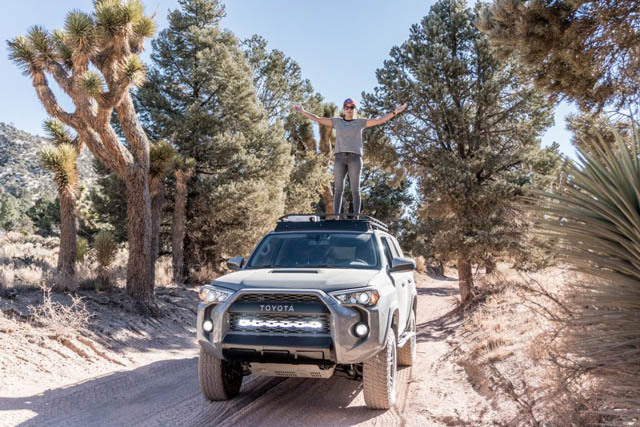 The TRD PRO comes from the factory equipped with an upgraded off-road suspicion, built around the Bilstein 5100, already giving the TRD PRO a slightly more aggressive stance than regular 5th Gen 4Runners with a 1″ rake in the front. I wanted to add a little lift, and the DayStar spacer kit seemed to be the most economical option. I really like the new stance, allowing more clearance for bigger tires in the future. After leg day, it can be a little hard jumping into the truck. At least the sliders add a little step for my shorter friends. Buy the DayStar Spacer Lift Kit here. 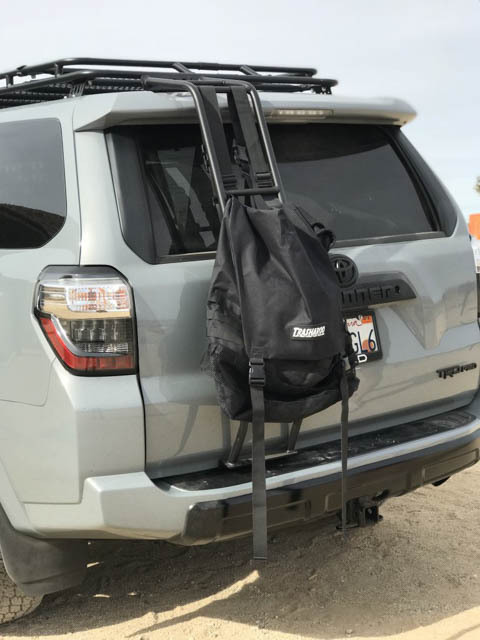 After purchasing my Gobi Rack, I realized that I’d be able to easily mount a Trasharoo Off-Road Trash bag to the rear of my vehicle using the GOBI Ladder. I like the Trasharoo as it allows me to keep garbage and trail trash outside of my car. For my in-depth review of the Trasharoo click here. I actually purchased the 1-Up Quick Single Bike Rack for my previous car. I liked the idea of being able to have a single carrier, instead of the traditional rack carriers which normally mount two bikes. Most of the time, I just have my bike with me, so this was a sleeker option for everyday use. What was nice about the 1-Up is that it comes with a 1 1/4” receiver with a 2” adapter, meaning I didn’t need to buy an entirely new rack when I changed cars. 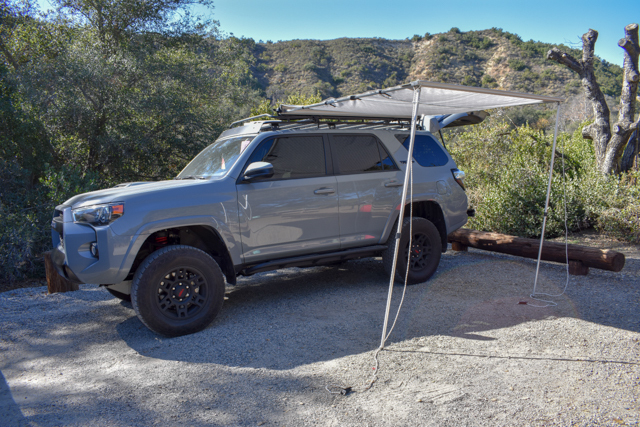 The perfect addition to my adventure vehicle, I chose to go with the Yakima SlimShady awning system not only because of it’s awesome name.. but because it offers a great value along with the Yakima lifetime warranty. One of the most important reasons I chose the Yakima SlimShady over other awning systems was the ease of installation and that it was lightweight enough for me to easily handle on my own. You can read my full review of the SlimShady here. 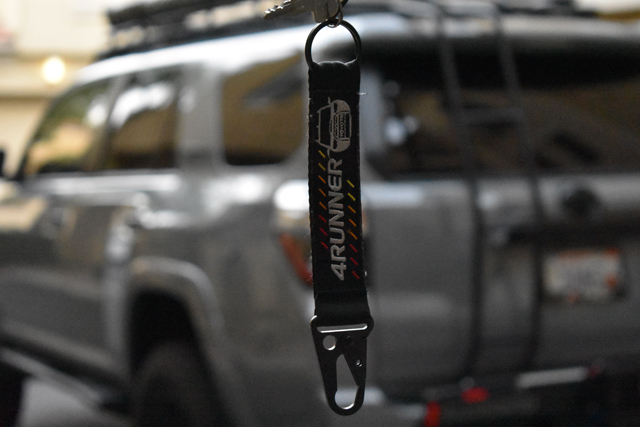 The AJT Designs Injection Key Fob allows you to upgrade the boring original Toyota key that comes with the 4Runner. 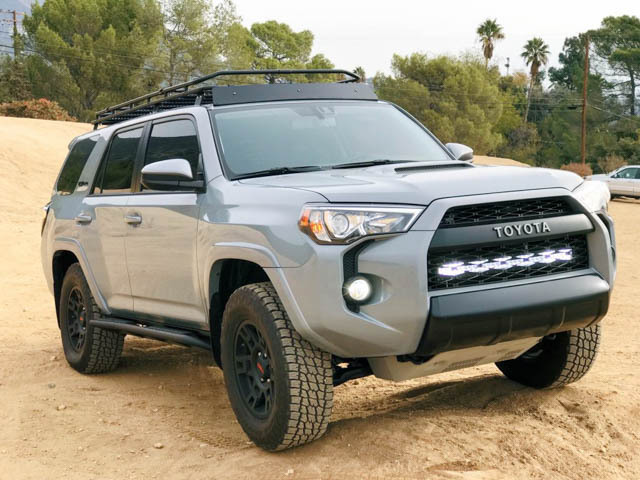 The AJT Designs Fob feels much more heavy duty and pairs perfectly with the rugged design of the 4Runner. AJT allows you to customize your key, also offering the unique TRD PRO colors such as Cement, Cavalry Blue, Inferno, and Quicksand. 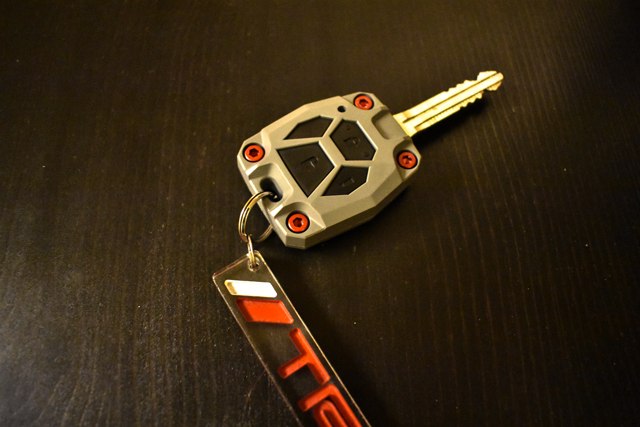 Click here to read more about the AJT Designs Injection Key Fob. Note: While these modifications have been fun, but I have noticed a drop in my gas mileage. Due to the added weight and decreased aerodynamics with the lift and addition of the rack to the vehicle I am running close to 16.5 MPG – a 2 MPG decrease from the factory. been loving all the updates on this build. I got my TRD OffRoad recently and have been thankful for this page!